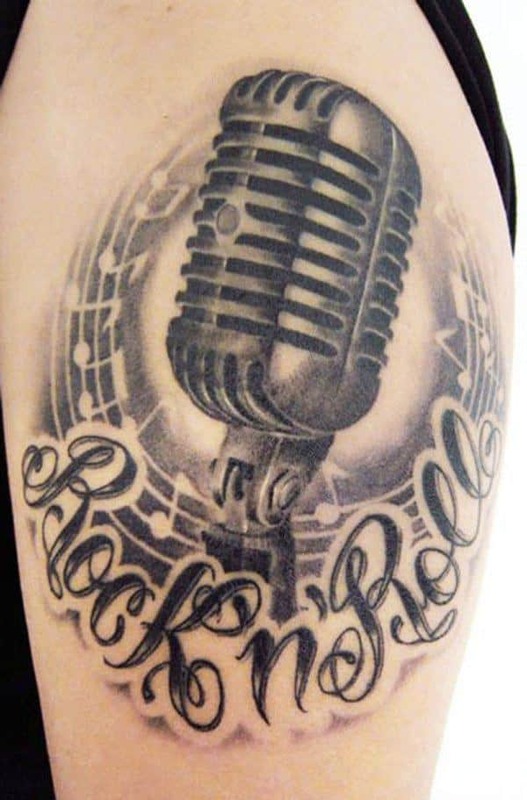 This depiction of a vintage microphone below which there’s the Rock ’n’ Roll inscription is a true statement. It’s a statement of style, but also, and perhaps more importantly, a statement of a way of life. 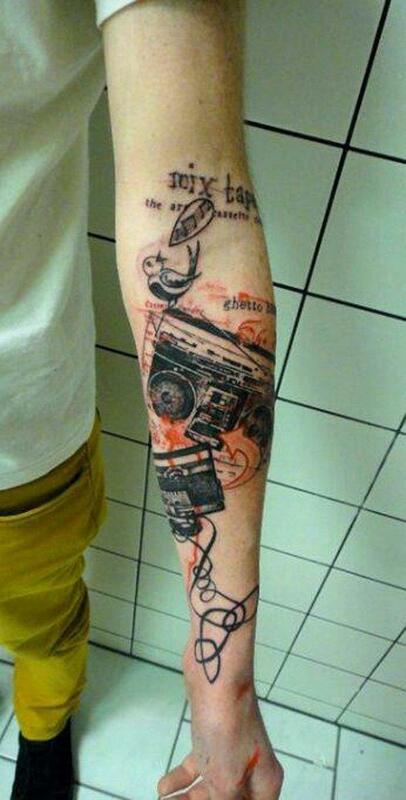 The tattoo presents another vintage theme, but this time of a boombox hosting a joyful little bird on top of it. Besides the music tape run wild, the extensive use of orange is what gives the scene a bit more urban feel. 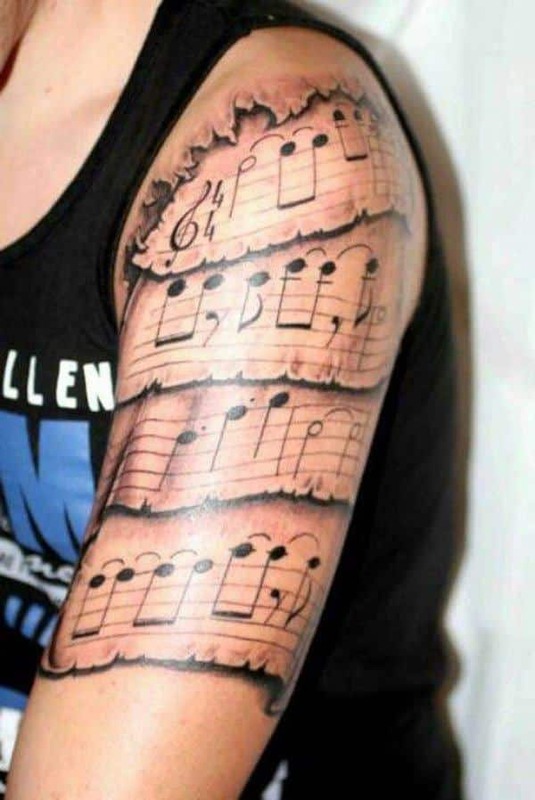 The lovers of tattoos and classical music will marvel at seeing this one. It depicts a lovely combination of colors and shapes, the former dominated by the chocolate-red, the latter by a stylish cello peg box. 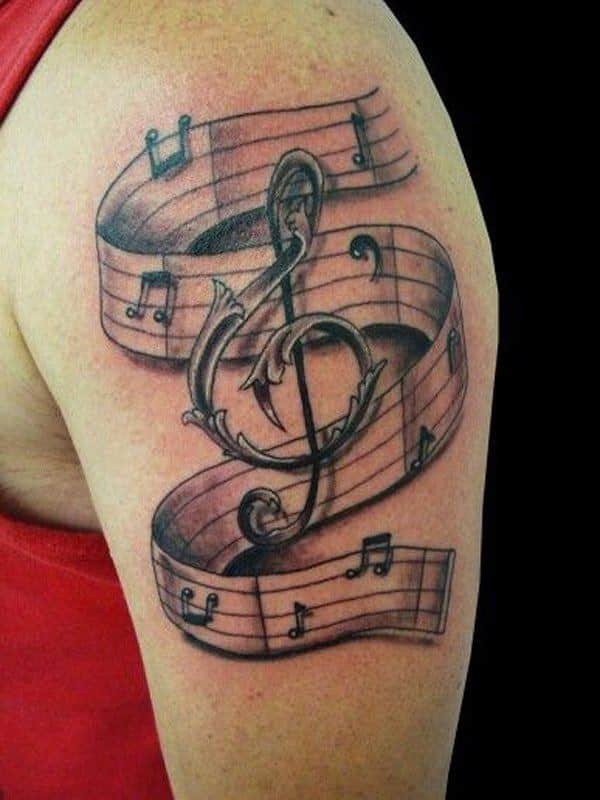 This is a perfect tattoo for those who dream of inking a music piece on their shoulder. Multiple layers of paper only add to the beauty and depth of the scene. 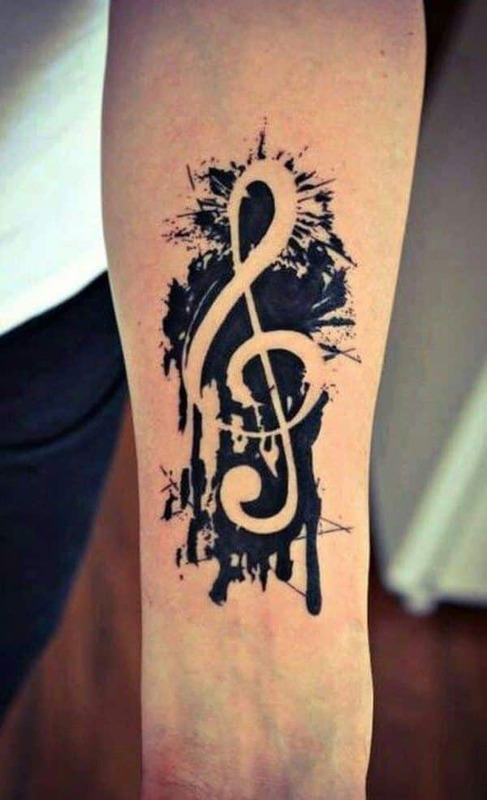 As a splash of black that failed to cover the shape of a treble clef, this is a more minimalistic music tattoo. The full, dense black immediately catches the eye of any who might passingly notice it, wondering whether the black ink finished its slide. The bending staff from the background invades the leafy forefront treble clef. 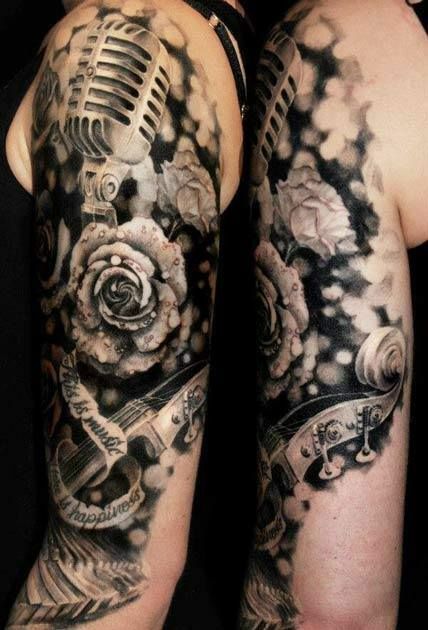 With its lack of sharp and jagged lines, this medium size music tattoo is itself a piece, itself the music. This is a depiction of a vast tree that branches off from a stable electric guitar root. 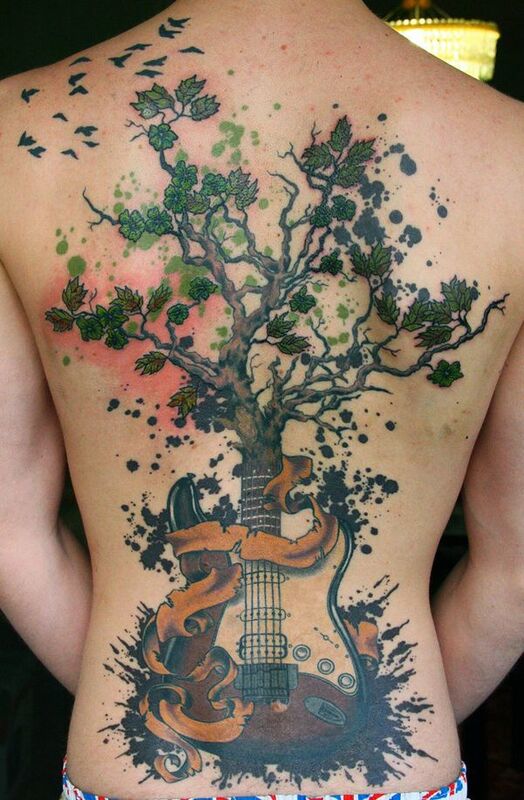 The tattoo features an extensive use of color as the red and orange of the guitar blend into green. The entire guitar-tree edifice aims to connect, or indeed reconnect music with nature. 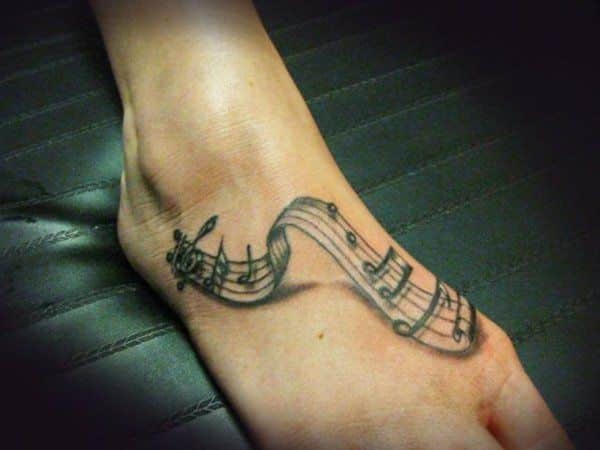 The tattoo is an illusory portrayal of a staff unwinding its way across the foot. Stretching as far as the foot allows, the staff hosts the notes that willingly form a music piece. The first glance at the tattoo might convince that If anywhere the colors steal the show, it would be here. 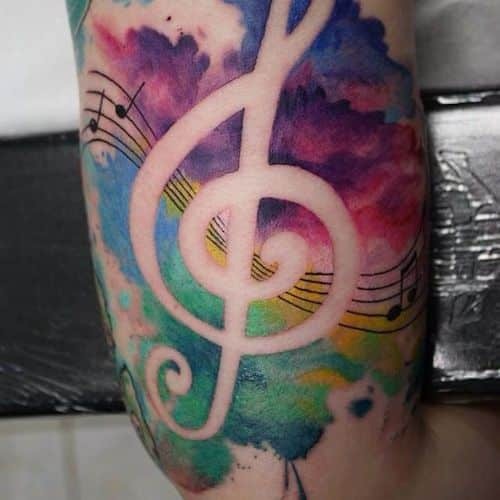 But the first glance might just as well be wrong, for the main star of the tattoo is perhaps the absence of color, the vast treble clef in the middle. But whichever way you look, one thing is certain: This tattoo is gorgeous. 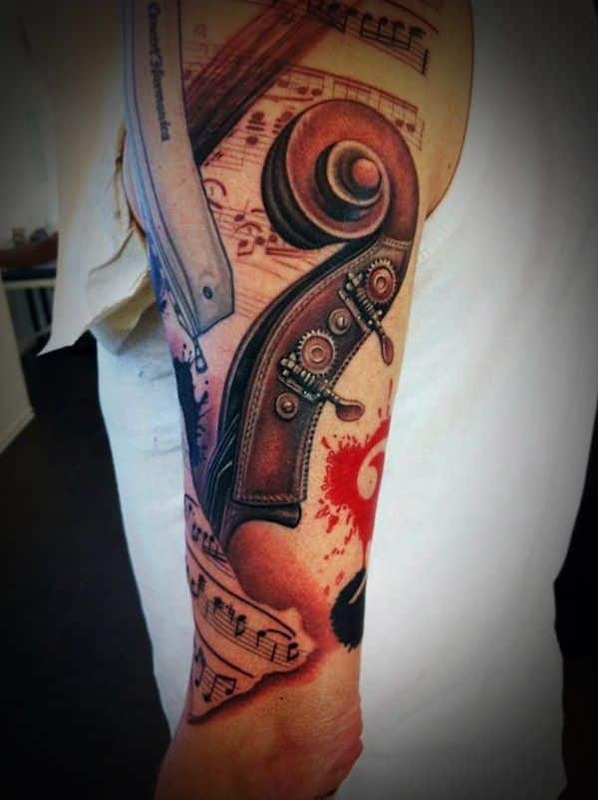 The piano keys, a microphone, and a cello peg box; is there anything that might enhance the music symbolism in this tattoo? Indeed there is – it’s the sprawling roses.